In continued partnership, the Madison Region Economic Partnership (MadREP) and the Urban League of Greater Madison (ULGM) will host a joint event for Madison Region business and community leaders focused on economic development and diversity. This Summit builds on last year’s inaugural joint event and marries MadREP’s annual State of the Madison Region Summit and the Urban League’s Workplace Diversity & Leadership Summit in recognition of the need for authentic collaboration to advance the region’s economy, understand the impact of diversity within business, and improve opportunities for all the region’s citizens. 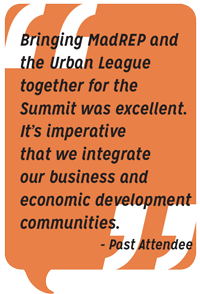 The day-long Summit will engage, educate, and empower attendees around issues related to economic, workforce, and community development. Held at the Monona Terrace, the event will feature keynote speakers, break-out sessions, and ample networking opportunities. Hundreds of participants representing the entire eight-county Madison Region will be in attendance. This will include business executives, HR professionals and hiring managers, community leaders, economic development professionals, educators, elected officials, entrepreneurs, and emerging leaders. View the agenda and learn more about the featured speakers.